Went out shopping last weekend with the fabulous Leora and we stalked every Marc Jacobs store on Manhattan in search of sunglasses, rain boots and other such cuteness. I ended up grabbing the tote on the left… sturdy cotton canvas, roomy interior and super duper cheap at $12. Perfect size for shopping or going to the beach or as an extra bag on vacation. I also appreciated the roundabout type on the navy tote… very funny, Mr Jacobs. 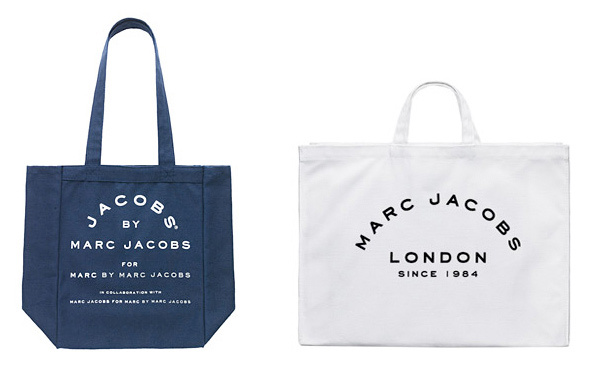 The similarly cute London tote is only available in the London store. These items are part of his Special Items collection which include a variety of inexpensive accessories such as plastic bangles, charm necklaces, key rings, and purse compacts. Jacobs by Marc Jacobs tote, $12. London Shopping Bag, 7GBP. Available only in Marc Jacobs stores and Marc Jacobs London. Love your blog! These bags show there”s something for everybody-actually shouldn’t they be give-aways with the free advertising! Marc Jacob’s is by far one of my favorite designers. Any luck on the rain boots? Hi Jonathan. No luck for ladies’ boots but the Marc by Marc Jacobs store on Bleecker (not the one on West 11th by Magnolia, the other one a few blocks down.) had a TON of men’s rainboots. If you go to the Special Items section on the Marc Jacobs site, you’ll see them. $35 in multiple colorways. Marc Jacobs + $12= hooray! How fun and over the top fashion-y to use one as a grocery bag. i’m so jealous. i went to the marc jacobs here in boston but they were already sold out of those bags! i did manage to score me a white patent leather keychain for $5 tho.